So on Super Bowl weekend and our non-essential federal fish-crats and their elves back to work, what is in the fishery news for today. 1- MASSACHUSETTS GOING 'ALL IN' - THE MOST ONEROUS RECREATIONAL 'SCUP' COMPLIANCE MEASURES YET? a. For each customer, INDIVIDUALLY labelled pails. Now since fishery management along the whole coast has entered bizarro - world, but this one goes right to the very top as we are talking about....scuppo's,....and compliance of a fishery the MAFMC cannot even give away these days has those considering the most burdensome for-hire regulations yet. 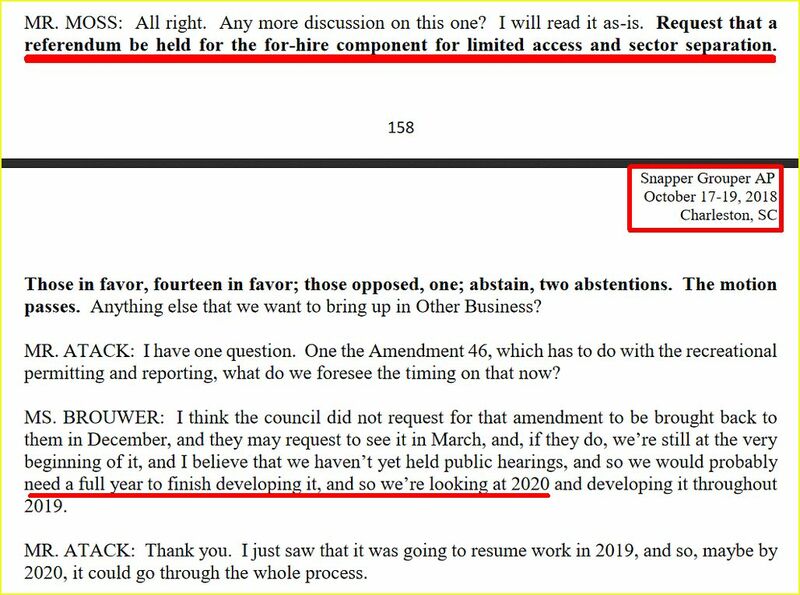 Could this be in response (aka backlash) to the most recent Law Enforcement Workshop where nothing was actually settled on the legal responsibilities of operators and the crew, and this is now the near end (or shall I say, "rear end") result to tighten up the so-called regulatory loopholes on the state level? Either way this is a regulatory imposition of which no one wants to come to any fishery in our region, and I do hope that some reasonable people can sit around the regulatory table and 'figuratively' sort this out. 2- 2019 RECREATIONAL GROUNDFISH MEASURES & GOMaine 'SECTOR SEPARATION' NOW BEING CONSIDERED? "Given the extended federal government shutdown, recreational fishermen are questioning what will happen come May 1, the start of the 2019 groundfish fishing year. The short answer is that 2018 measures for Gulf of Maine cod, Gulf of Maine haddock, and Georges Bank cod, which are shown in the table, will remain effective until replaced by a new rule in 2019." As of this time and which one can see on the chart below, nothing has changed as far as what you can and cannot take home, along with the possibility that either the possession limits and size limits will remain the same for sometime after when the fishing calendar starts on May 1st. More important,.....There was something very interesting which I posted a while back (if you read the regulatory updates on Fishing United .com) about a consideration proposed by the RAP of some form of "separate mode measures" as far as different regulations for "possession - size - season"..... and of course the thought of now bringing a regulatory distinction between party, charter and private vessel fishermen (in this case). Before anyone starts shooting from the lip, we have variations of separate regulatory measures in a number of regional fisheries, one being Blueline Tilefish in particular "from and through" the initial scoping to the final rule making process, a distinct possession limit scheme between each of the modes are now in place. 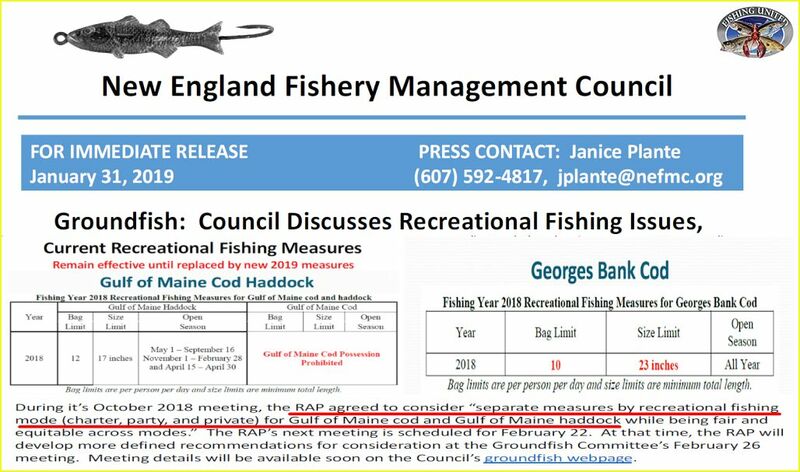 Either way, I do believe that there should be some by-catch harvest allowance for a codfish or two to be kept by GOMaine recreational fishermen, as well as resetting the haddock possession limit to return to a possession of 15 fish. As for the Georges - SNE cod management area, the NEFMC should realize that the amount of discards created when increasing the minimum size up one inch from 22 inches to 23 inches, has negatively impacted both fishermen and the fish (hook mortality). The upgrading in size has angler behavior that results in and literally just forces fishermen to target bigger fish, and at this time we should know better as so far as having fishermen target the biggest fish especially when their is a somewhat restrictive possession (bag) limit in place (ie: striped bass). The regulatory discard and the implications in being forced to shovel and toss over perfectly fine eating fish is one of the biggest regulatory issues to be solved. Yes in the minds of the fishcrats and fish counters, when 'Catch Management' meets up with the on the water reality world of course ends up with sorting through and retaining the biggest fish, and then creating the sight of the proverbial flotsam and red balloons on top of the water just floating into the sunset. "Went to the meeting yesterday, same old dog poo. Refuse to acknowledge that high lease fees are the cause of boats dumping fish back. Even after admitting VMS shows that trips with observers don’t go to the same spots as when they don’t have observation, we’ve caught almost as much cod as was landed on the Portland exchange. Won’t change until the reduce the lease fees. They ought to put electric monitoring on all boats then they would have to dump the fees as everyone would tank." Now I understand these thoughts, and this can start some "bomb throwing" over this statement, but I hope that many take the essence/reality of what is being stated here. From what I have heard and seen, GOMaine cod seem to be showing positive signs, while Georges - SNE cod remain in "a questionable depleted state" at this time. Am I making an reasonable assessment of 2018 cod? The point here is that when you have the onerous force of government with a perishable resource, it will result with the implications which this fishermen stated. Again there is much more with what is going on here, and I like to move along here to what is currently creating some ulcers and heart palpitations in the SAFMC and GOMex mgmt. region. 4- PARTY - CHARTER: FULL TIME VMS IF YOU HAVE CERTAIN PERMITS? YES SIR! There has also been a number of comments sent into the Federal e-gov site which can be read and which will give one the idea that there are those (a good number - of course) who want the imposition of full time VMS or as they clarify in a number of the most recent documents with GPS vessel tracking on for-hire vessels. It does appear that final rule making is around the corner (sometime between 2019 through 2020) for those in the for-hire industry to have some type of full time electronic monitoring in place. "MR. PASKIEWICZ (Recreational/FL): What I’m hearing is some mixed emotions about all of these things, but what is at the heart of the subject is that we’re trying to get everybody to help conserve the life of many fish in many different ways. I think it’s a wonderful thing." Mic drop moment for "It's a wonderful thing..."
For whom I ask, but that is the thinking folks, and what we are up against these days when we stepped into a room with fishcrats..
More so, do not be surprised that this has already been discussed about a fishery up in the MAFMC..... BSB, and of course the "connectivity" of what happens in one management region, possibly impacting another. Yes connectivity is the word here. To close on this thought.... remember that new Modern Fish-A-Whatever Act that was just signed into law by POTUS? This is where you are going to see the impact, first right in the SAFMC and GOMex mgmt regions. Better yet, there is specifically written verbiage in the documents that for-hire operator 'Catch & Harvest locations' (aka your GPS honey holes) will be used as another data stream for future stock assessments, improving recreational harvest estimates and subsequent allocations, impacts to spawning aggregations and high fishing effort activity - vessel congregation areas (yes the spots where vessels have to go to in fact catch fish!). Is this the 'Brave New World' for future fishermen in the fishing industry? How could this be as we are living through the most constrictive regulatory possession limit environment, especially in Tom Brady's favorite state, where you have catch estimates that I doubt Captain Monty Hawkins or myself can make any sense of. 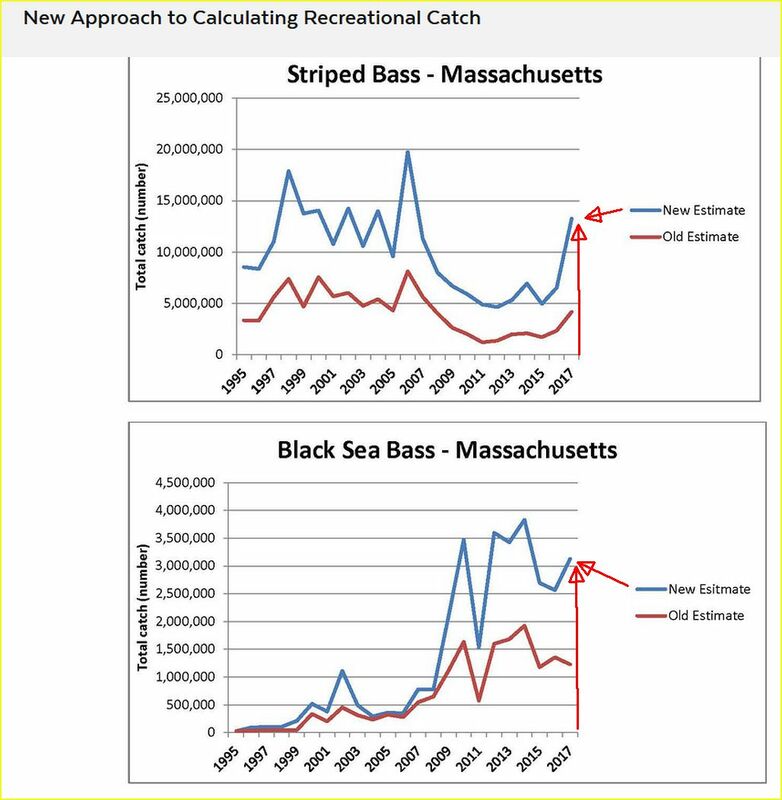 Better yet, just prior to these fantasy island charts, was two prior separate stories, one about proposals on 'no gaffing' of striped bass and mandatory circle hook use in this fishery for all sectors, as well as another brief highlight that commercial fishermen in MA. neither caught their full quota of bluefish and striped bass in 2018. Yes the commercial bluefish quota was not fully utilized and where it was noted that 2018 the lowest amount of pounds reported to be landed in over four decades and ten percent of the striped bass quota was not used. But how about those sharpie recreational fishermen though? Somehow, when one looks at the MA. - SB chart, catch estimates on this species is the highest since 2007! How could that be, and are SB commercial fishermen now having trouble catching stripers while the recreational sector is enjoying some of the best fishing in over a decade? Say it ain't so! Now how about those biscuit numbers? The highest in and over the time series with a season that runs barely four and a half months and just 5 black beauties in the pail? Heck MRIP says so... right? "The new methodology has resulted in much higher estimates of recreational fishing effort compared to the old methodology, sometimes as much as 2–4 times as many fishing trips." 6- SUMMER FLOUNDER 2019...WHAT DOES THE MAGIC 8 BALL SAY? 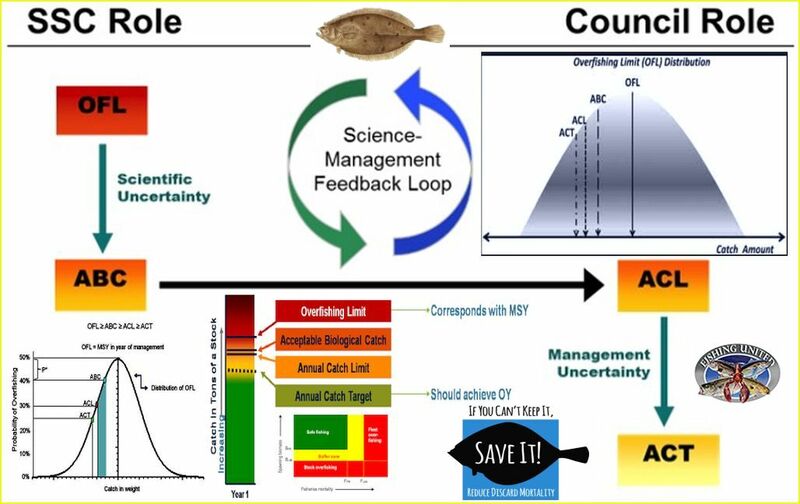 Question... what happens when you mix the most complex modeled, then peer reviewed fluke stock assessment with the wizards from the SSC? Answer... who the heck knows, but one thing that now seems to be lingering in the air conditioned offices of the fishcrats is the issue over discards...yes regulatory discards. What do we do here? What happens when you use a bulldozer to put dirt into - to try to fill a flower pot? The vast majority of the dirt is just wasted...and so is the issue with the fluke fishery as the product is paying the price - season after the season due to catch limits, discards created, and for the recreational sector which is forced into using larger minimum size limits in order to retain both a reasonable pail limit and open days during the season. Is their a problem with the fluke biomass? Again who knows, but does anyone remember something about a 16 percent liberalization for 2019, or was that just pillow talk? Or on what the peer review will come up, then with what filters through the uncertainty (aka reductions) from the science and management removals before both the commercial and recreational sector gets to the point of what little they can legally possess? At this time with fluke, there are NO set in stone regulations or guidance for for the recreational sector in 2019, but it is pretty obvious that 'Catch Management' especially with the targeting of female fluke, has to be addressed. As I keep mentioning with the trend of pushing minimum sizes larger (except for scup, and isn't it amazing that it is a very robust fishery), there has to be some state pilot programs which allow anglers to harvest smaller fish in order to help lessen today's theme, wasteful regulatory discards. 7- NYS FFL - GEORGE LAPOINTE REPORT? Word from this morning....up in the back offices somewhere in Albany. Any complaints, issues, worries, concerns or gives a hoot...call the NYS DEC office located in the hinterland due north of fantasy island. "Jan 18th: I learned today, via phone, that Steve Selmer became the new, official, International Game Fish Association, All Tackle World Record white hake world record holder. Caught on July 17, 2018, the fish unofficially weighed 54 pounds moments after being caught. That hake of Steve's was the largest that had been caught on the Bunny Clark since Tom Giorgio, a prize fighter from near Troy, New York, caught a 55 pounder with me in the summer of 1985. We put Steve's fish on ice in a box but were too far offshore to get the fish officially weighed on the day it was caught. So we had to wait until the next day. On the next day, I helped Steve get the fish weighed officially. After all that time, the fish still weighed 48 pounds 4 ounces. The existing all tackle world record white hake, at that time, weighed 46 pounds. That fish was caught by John Audet (ME) aboard the Bunny Clark on October 26, 1986. The difference in weight between the two fish was enough to make Steve's fish the new world record if it were approved by the IGFA. That approval was granted yesterday. This is the forty-third world record caught on the Bunny Clark since 1984 when Marjorie Kerr (VT) caught her 83 pound cod in June of that year. The Bunny Clark world records (both current and defeated) include all tackle world records, line class world records and junior angler world records. Congratulations, Steve! Great job by a great angler!" Folks, the followup and paperwork can be a pain; and we do know that there have been larger white hake caught on a few noted party boats out of New England through New Jersey over the decades, but someone did take the time to follow through and the result is without a doubt something deserves humbled recognition from the fishing community, especially in these trying times with either fish stocks and fishery management. Someone made mention about what he termed a "feel good" story about Zach commenting about his future, or if there is any future for young fishermen in this state. "These days, you retire into fishing, because all around you see those who are in the fishing industry that are being economically forced out of fishing....."
Make sure you find a job where in the future that the pension fairy visits you at the end of each and every month, and where you have a decent medical plan which most doctors and hospitals will accept. Do we say anymore here? 10 - FINALLY, THIS SUPER BOWL WEEKEND?